​ The car battery’s health is important to prevent you having a bad luck day, when your car won’t start when you need it the most. The extreme temperatures of this summer played a large part on our increased service calls for jumpstart service in Norcross. Please take your vehicle to any stores mentioned in this article to get a free battery check and complete diagnostic at no charge to you. Your car's battery is the heart of your car. If it’s not functioning properly, nothing will work properly. Avoid the inconvenience of having a dead battery and damage to your electrical system and extra expenses with a jump start service cost. But if it does happens to you and you need a fast recovery truck in Norcross, GA please call Norcross Tow N Go today at 404-471-3283. We are the best roadside service near Jimmy Carter. Please replace your battery in time, to avoid the need of looking for a roadside service nearby when that happens to you. 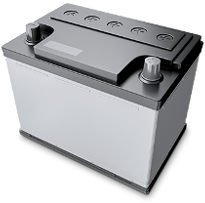 A battery test will determine the condition of your battery and will let you know how soon you need to prepare yourself to buy a new one and not get stuck at home or at work waiting for a quick recovery towing truck. Most manufacturers recommend testing your battery every 15.000 miles. When changing your battery it’s recommended to follow some important steps that is why we recommend to let a specialist do it. There are some stores in Norcross GA that offer this service for free to identify if your problem is coming from the engine, the battery or other parts. They test for battery, alternator, starter and voltage regulator, control modules, coils, throttle position sensor and many other. If your battery is dead because you left your light on all night, but you know it has more life in it you can take it to any auto store and they will charge it for free in less than 30 minutes and you can get back to your daily task. Some of the local store even run pronotional offers to get your new battery for a good price. 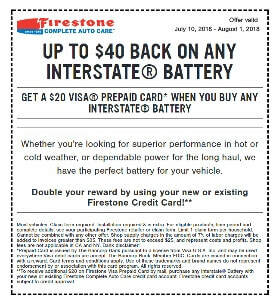 Check out this one from the local Firestone store. Get the offer here. ​ All these stores offer free battery installation service if you purchase it from them and also free battery charging on the spot. Some of this steps involve removing the cables and terminals cleaning any debris it may exist, replacing the battery cables and terminals if needed, properly tightening the cable and clamps and treating for corrosion prevention. No need to DIY when a professional will do it for free. There are a few signs that it might be time to replace your car's battery. Read all about this signs here.